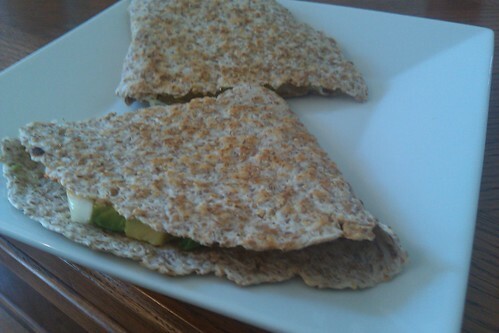 Avocado Quesadilla, a photo by bysarahrae on Flickr. I have actually made this about four times in the past week and a half. It is soooo delicious. The first experience was on an ordinary evening when the bf offered to pick up some groceries on his way home from work which I could then use to cook dinner. (This is a common practice, its OK because I am happy to cook and if I really wanted/needed him to take care of dinner he totally would.) I had some avocados and that was my foundation. Upon a search of one of my favorite blogs Big Girls Small Kitchen, I came across their recipe for this quesadilla, whom they said was first seen in a David Tanis book. You can check out the post/recipe that inspired my dinner (and many future meals) here. (And you might as well check out the rest of the blog while you're at it because it is fantastic.) Later quesadilla iterations, including the one pictured above have also enjoyed the addition of some sliced onions and Sriracha. The onions give the dish a really good crunch and well, Sriracha just belongs on everything.